Starting into indoor growing and making the right decision of selecting the right LED Grow Light is a bit tough task as we all know. So here we are with our Viparspectra 300W LED Grow Light Review. Yeah, the sole purpose of this review is to pass on the fruitful and extremely essential information about this heart pleasing LED Grow light to you. One of our readers shared his experience that on his early stages of indoor growing how he wasted his money on a 200$ LED Grow lights and ended up being cheated with cheap grow light. And, that’s why we want to share this few cents of information with our readers so that they could decide well where to spend their money to get decent returns. As far as Viparspectra is concerned, it’s an old brand, doing well on the market, has a waste customer base and giving right kind of products with no false claims. So, let us start with the core of this article, and that is to review Viparspectra 300W LED Grow Light for you to help you in making the right decision. 1.1.1 Brand – Is it reliable and trustworthy? 1.1.2 Build – How’s the quality of parts? 1.1.3 Spectrum – How’s the Quality of Light? 1.1.4 Intensity – How intense and bright the light is? 1.1.5 Power Efficiency – What is the amount of watts it actually require for proper functioning? 1.1.6 Coverage – What is Coverage Capability of Viparspectra 300W? 1.1.7 Cooling – Is it hazardless? 1.1.8 After Sales – Do they care about their customers after selling light? 1.4 What are additional features and capabilities of Viparspectra 300 Watt LED Grow Light? For ease of understanding we’re going to divide each aspect of Viparspectra 300W LED in to several segments. Brand – Is it reliable and trustworthy? Viparspectra is a brand owned by Shenzhen Bailuo Technology Co. Ltd which is located in China and has several warehouses in many of the tier one countries. The brand is on the market for more than 8 long years. With time they kept improving their product lines and gifted indoor gardening community with several evergreen products. Their product line is divided into several series where Reflector, Dimmable and PAR being the most famous among growers. Viparspectra has a vast customer base along with highest possible satisfaction feedback. Yeah, they are utmost trustworthy and reliable as far as their products are concerned. The major thing that we liked about this brand is they are doing well without giving any false claim. What you see is what you get. Build – How’s the quality of parts? As far as Viparspectra 300W LED Grow Light is concerned, it is a beginner level grow light and comes with a highly durable build. Parts used in the manufacturing grow light consist of both in-house manufactured parts and third party parts. The outer body is made up of the high-quality metallic material, and decent black coloured finishing helps it to fight against rust problem. Inner panel, cooling fans, light emitting diodes and panel drivers used in its making are from either high-end brands like epistar and bridgelux or from the manufacturer itself. At the back of the panel, you’ll notice one ON/OFF switch, a power inlet, and a power outlet to help you with daisy chaining. Yeah, for the quality of parts and build of lights all we could say is it wins. However, as we already stated it is a beginner level grow light and hence we can’t expect it to be a waterproof panel. Spectrum – How’s the Quality of Light? As we all know, spectrum and intensity of a grow light is an ultimate game-winning factor. Yeah, it is the most crucial and extremely vital part of any indoor growing venture. As far as Viparspectra 300 Watt is concerned, it features a full spectrum light quality and spectrum of this grow light includes all the critical bands that your plants crave for. If you want to know in detail then let me tell you that spectrum of this grow light ranges between 450nm – 730nm and two additional bands 3000K and 7500K adds the charm in the light quality. Yeah, Viparspectra 300W comes with a most vital element called Infrared at the range of 730nm. Moreover, don’t worry if you notice this light to be dim because it is not non-functioning but it is IR, and an excessive amount of this band could hurt your plants. Intensity – How intense and bright the light is? If you’re here with your research, then you might be knowing that the quality of light is measured using PAR. Yeah, it is Photosynthetically Active Radiation, which measures the amount of light spread on a specific area from a particular height. 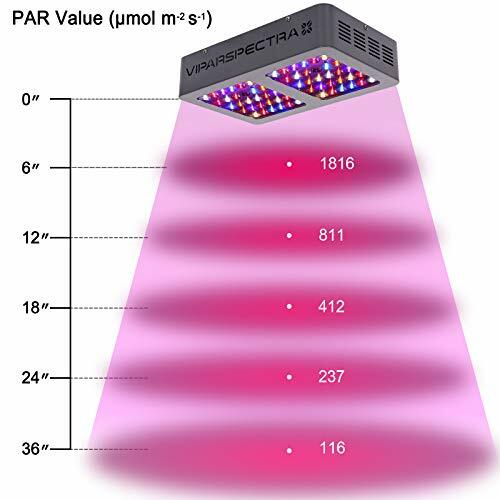 PAR value recorded by Viparspectra Reflector 300W LED Grow Light is 300 uMol from the height of 24” and from the height of 18” you can achieve around 483 uMol. Yeah, light is intense and highly absorbable by your indoor weed plants. Higher PAR results mean higher intensity which helps in improvising glucose formation process by photosynthesis. JFYI:- We request our readers to not focus on HPS replacement figures of any grow light because it’s just a technical figure and it doesn’t have any relation in actual quality or intensity of the light. Look at this modern technology of indoor growing lights called COB LED Grow Lights. Power Efficiency – What is the amount of watts it actually require for proper functioning? Power efficiency is the crucial part to consider while buying an LED Grow light. However, you’ll be glad to know that Viparspectra isn’t just affordable for the initial part as it also helps you in saving a tremendous amount of money in the longer run. Yeah, a massive amount of money in terms of less power consumption compared to other lights in the 300W segment. Viparspectra 300W only consumes around 130W of electricity from the power outlet and spreads high quality and perfectly intense light all over your plant canopies. 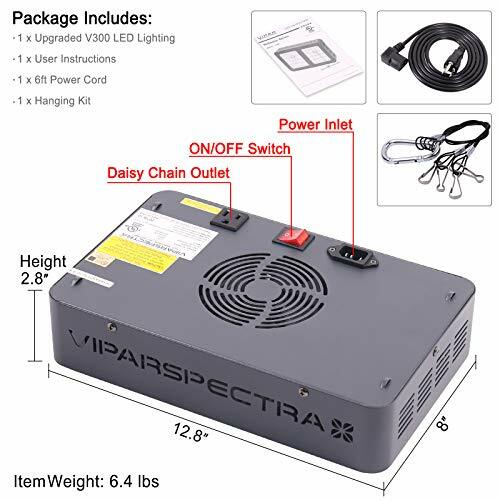 However, we’d like to tell you in this viparspectra 300W Review that if you compare the power consumption of this grow light with any grow light in this price range and 300W segment, then you’ll get what you were going to buy by ignoring this long run companion from viparspecta. 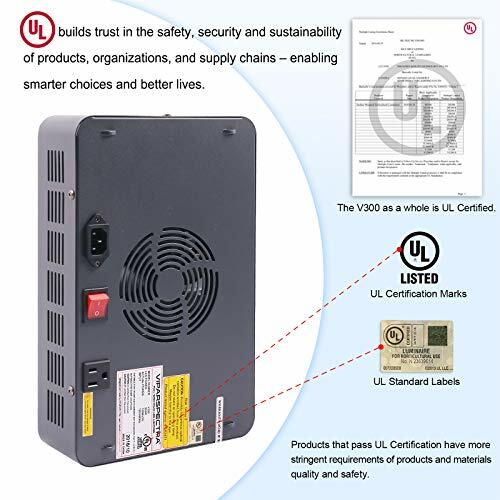 Coverage – What is Coverage Capability of Viparspectra 300W? Here’s the most crucial part using which many manufacturers are trapping the customers with false claims. As far as Viparspectra V300 is concerned, you’ll get around 2.5’ X 2.5’ of coverage capability from the height of 24” during vegetation while during flowering you can achieve around 2’ X 2’ of coverage from the height of 18”. We’ve got several questions regarding this change in coverage with a change in the growing phase. All we’d say to you is during flowering your plants need more intense lights. Moreover, to provide them with intensity lowering the height and keeping light closer to your plants could help you further. People with Higher Coverage Expectancy Might like to Read Reviews of 600W LED Grow Lights. Cooling – Is it hazardless? One of the biggest worries in indoor growing is the cooling capabilities of an LED Grow light. However, with Viparspectra 300W you’ll not have to worry about cooling and temperature anymore. Yeah, it is equipped with 4.72” high quality and durable cooling fan along with finely finished aluminium heat sink that is far better than any other grow light available on the market at this rates. Combination of this fabulous cooling fan and aluminium heat sink makes thing more comfortable for you and gives ample room for keeping things balanced in terms of temperature and heat. After Sales – Do they care about their customers after selling light? The brand name Viparspectra is known for the level of satisfaction and convenience they offer to their consumers. Also, with VIparspectra 300W you’ll get 3 years warranty and customer support along with 30 days money back guaranty in case they fail to satisfy you within that time. Watch this Video Review of Viparspectra 300W LED Grow Light For Quick Under Standing. Light is so intense that it needs safety glass to look at it. It is not waterproof so needs extra care from dripping water. What are additional features and capabilities of Viparspectra 300 Watt LED Grow Light? As we already talked about build, design, spectrum, intensity, coverage and cooling capabilities, now is the time to focus on some other technical specifications as well. In terms of dimensions Viparspectra features form factor of 12.6” X 7.9” X 3” with help of which you can easily determine whether it is compatible for your grow tent or not? This grow light provides uniform light for all phases of plant life cycle and you’ll not worry about changing modes again and again. LED are placed at 90 degrees angle to increase penetration rate for plants photosynthesis process. 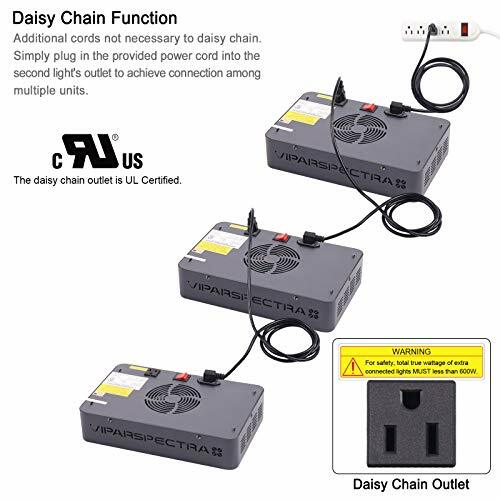 It is compatible with AC100-240V power system in any usual home. Viparspectra V300 works with frequency of 50-60 Hz. It can last longer by giving you operation lifespan of 100,000 hours. To share some real experience with people, we approached some existing viparspectra V300 users and asked for their opinions and whether they’ll recommend it to a beginner or not? John: Yeah, I’m using viparspectra 300W LED grow light since last 6 month or so, and I’m glad to tell you that it is fabulous. I’ve got better and dense flowers this time compared to my old cheap led that was not working up to my expectation. Yeah, I’ll surely recommend this grow light to a beginner as it’s user-friendly and can create wonder in any indoor grow space. Mike: Well, I’m not using it for more than two months but so far so good. 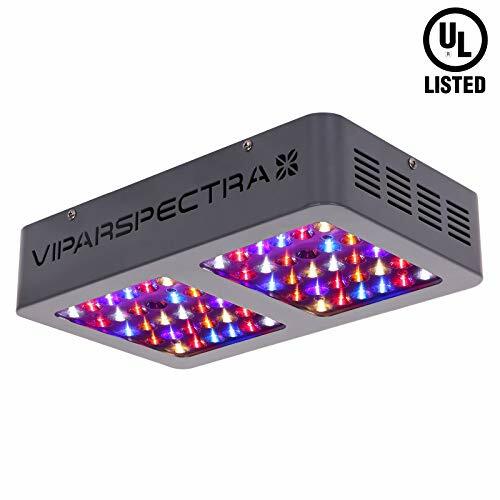 I have not experienced any problem either with plants or with LED so I’ll recommend Viparspectra 300 watt or any other higher variant from viparspectra to fellow gardeners. Stephan: Using it and I’m happy with it as far as light is concerned. However, I needed to order another one as I planned to expand grow space. However, with daisy chaining, it won’t be troublesome for me. So, yeah I’ll recommend it. Also, yeah, it was replaced product because the former one defected and I asked the seller to provide me with a replacement so within one week I was ready with a new piece. Thanks. So guys that were just a limelight over some stories that people shared with 420ExpertGuide. 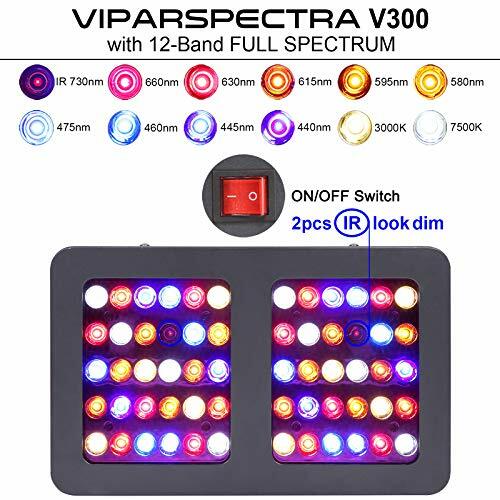 Viparspectra V300 300W LED Grow Light has enormous 700+ reviews on the Amazon where the majority of people has showered it with 5 or 4-star ratings to it. Although these figures speak for itself, we’d still like to give a glance to why you should consider this grow light in your wishlist? The grow light by viparspectra is basic level grow light designed especially for beginners. So, level of coverage isn’t so huge but enough to cover around 3 average sized plants beneath it. However, coverage shouldn’t be your concern at the beginning instead you should focus on intensity and efficiency of an LED grow light at this stage. Moreover, in that case, Viparspectra V300 has the decent capability, and compatibility for your small sized grow tent. It is capable of providing valuable lighting effect similar to sunlight for your plants. With the help of this quality of light, your plants will be able to absorb more light and generate the required amount of glucose sugars using photosynthesis process. People who’re still concerned about coverage should go for viparspectra 600W LED grow light with more considerable coverage capability. So, yeah, looking at features, capabilities, lighting effect and cooling ability we’d surely recommend our readers to go for this fabulous LED grow light from viparspectra in the 300W segment. This viparspectra 300W review is aimed to provide you with the tiniest detail possible regarding this beautiful led grow light. So, we hope you’ve like taking a long ride instead of hauling over a general overview about light.